Today, we published a “Notice of Proposed Rulemaking for the Summer Work Travel Program” to the Federal Register. Through February 27, 2017, the State Department will be taking comments on proposed changes to the regulation that governs the J-1 Summer Work Travel Program. 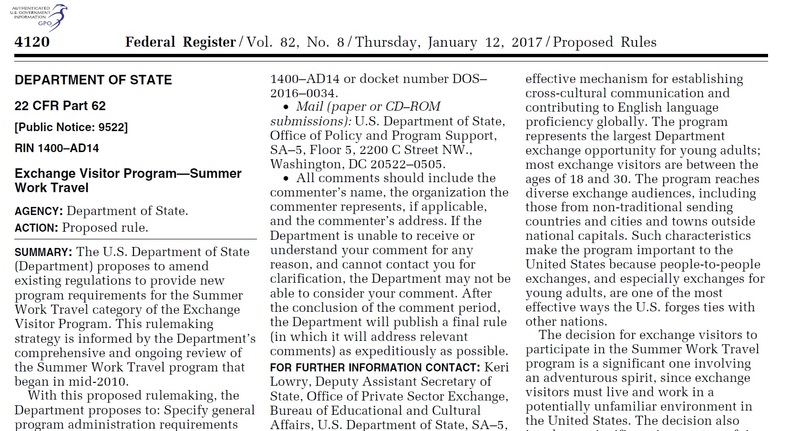 As stated in the Federal Register entry, the State Department proposes to: Specify general program administration requirements for sponsors and their third parties; enhance transparency in the recruitment of exchange visitors; limit exchange visitor repeat participation to a total of three visits; require exchange visitors to be placed in advance of their arrival in the United States; outline additional sponsor responsibilities for use and vetting of host entities; and specify host entity requirements for program participation. In addition, the proposed rule limits the number of late night and early morning hours during which exchange visitors may work; explains new processes for exchange visitor housing; and introduces Form DS-7007 (Host Placement Certification). The proposed rule also specifies more exactly pre-departure orientation and documentation requirements, including with respect to bicycle safety; ensures that sponsors and host entities provide exchange visitors an appropriate number of cross-cultural activities; and outlines processes for sponsor use and vetting of domestic and foreign third parties. If you are interested in seeing all the proposed changes to the regulations, you can find them in the Federal Register.